Is that really the Rafale fighter plane for which India has done deal with France ? A Video of a flying fighter plane is viral on WhatsApp and on other platforms as well which shows various aerobatics lie tumbling in the air, vertical stop etc. The text reads along with video “That’s Rafale Fighter plane for which India has done deal with France! First of all it’s not a real fighter plane but a Remote Controlled small plane. The image below, a screenshot from the viral video gives a clear idea of the size of the plane. Compare the Plane and it’s shadow with the runway and distance from camera. 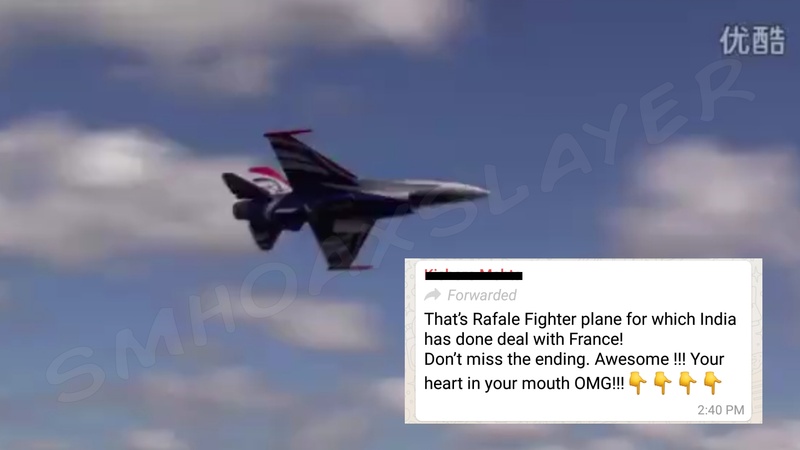 That’s Rafale Fighter plane for which India has done deal with France !Don’t miss the ending – Awesome ! !Your heart in your mouth OMG ! That’s Rafale Fighter plane for which India has done deal with France!Don’t miss the ending. Awesome !!! That’s Rafale Fighter plane for which India has done deal with France! That’s Rafale Fighter plane for which India has done deal with France ! Don’t miss the ending – Awesome !! Your heart in your mouth OMG ! I liked a @YouTube video https://t.co/7ktnLlubjP That’s Rafale Fighter plane for which India has done deal with France! That’s Rafale Fighter plane for which India has done deal with France!At Seol S.Koria air show. @BJP4UP That’s Rafale Fighter plane for which India has done deal with France! कांग्रेसियो अब पाकिस्तान और चीन अपनी लौंडिया चुदवा लो !! !That’s Rafale Fighter plane for which India has done deal with France!Don’t miss the ending. Awesome !!! ← Did pig deliver a baby with mix features of human and pig ? They didn’t die of hunger, reason of death was electrocution. July 25, 2018 Hoax Slayer Comments Off on They didn’t die of hunger, reason of death was electrocution. Money stuffed in Bananas for Gujarat Elections ? Another TeleMarketing Scam. Don’t do it.